Looking to buy a large grill microwave? Panasonic offer the NN-GD566M, which provides 27 litres of capacity together with a sleek silver finish. 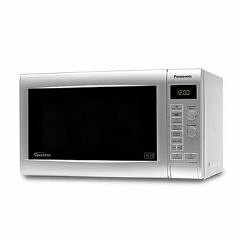 Overall power output is 900w when in regular microwave mode, and the large overall capacity means it can cater for the majority of large plates and dishes. 7 different power levels are featured, complete with auto weight reheat and cook features in order to make it easier for you to calculate cooking times. The grill is pretty powerful, featuring 1300w of power with 3 different settings, it browns and crisps beautifully. 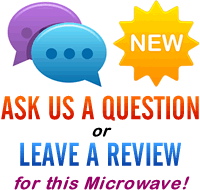 The controls are very easy to use, and our testers were impressed with both the ease of use, as well as the overall build quality of this microwave. Panasonic's Chaos defrost system worked well as per usual, and overall there is very little to fault with this silver microwave - it performs and looks great. Overall, the Panasonic NN-GD566M offers great value for money, is well constructed, and should offer years of service. We recommend this model for anyone needing a large grill microwave.